"We've lived so long under the spell of hierarchy-from god-kings to feudal lords to party bosses-that only recently have we awakened to see that regular citizens have had the capacity for self-governance, but that without their engagement our huge global crisis cannot be addressed. The changes needed for human society simply to survive, let along thrive, are so profound that the only way we will move toward them is if we ourselves, regular citizens, feel meaningful ownership of solutions through direct engagement. Our problems are too big, interrelated, and pervasive to yield to directives from on high." The first Chapter is on the Matrix and of course there is the Red pill and Blue pill story. In the movie, Neo takes the red pill and he awakens to a reality that is outside of the Matrix. For what Neo had assumed to be reality was only a collective illusion, fabricated by the Matrix mainframe and fed to a population that is asleep within it. Like Plato's famous metaphor of the cave, true reality and perceived reality exist in different planes. The author, apparently finding his own pharmacy for red pills, finds that our consensus reality-as generated by official rhetoric and amplified by mass media-bears very little relationship to actual reality. Starting with Imperialism and the Matrix, he quotes Abraham Lincoln: "Kings had always been involving and impoverishing their people in wars, pretending generally, if not always, that the good of the people was the object." He then moves to the London banking elites, their strategy of oil based dominance, and of course the Anglo-American Pax. He sees World War I as the first oil war, which of course it was. At the beginning of the war, the newly discovered mid east oil fields were under control of the Turkish-German alliance. After the armistice, they were controlled by Britain and their allies. So, within the Matrix, we had "unfortunate entangling alliances", where in reality, we had a trap secretly set by the British which was intended to ensnare Germany into war. The same goes for the Versailles peace conference. In the Matrix view, it was dominated by the personalities of Clemenceau, Wilson, and the other victors who because of their vindictiveness and shortsighted policies were responsible for the post war debt regime which brought stagnation and hardship on Europe and ultimately another war. In reality, it was the House of Morgan just collecting its debts. Most of us who work in the public life know that there is almost always a back story. And rarely does the back story make it to the light of day. Far too many of our brethren have been domesticated to see the world within the images and framing of those who profit from those who live their life within the pharmacology of the blue pill. Like other domesticated animals, our keepers come to us and scare us with their shouts and arm waving to move us out of the barn and into the green field where we find food and drink. As the day ends, they come and scare us again back into the barn. They keep us on their leash. We actually allow ourselves to be called consumers. But this book is not about describing the world of the Matrix, it is about escaping it. It is about envisioning a transformational movement and a liberated global society. Its about understanding and employing the dynamics of harmonization and cooperation. In our little village in the mountains, the Red pill is known. Many here understand that the reality that is painted on their TVs (if they watch at all), in the newspapers, and in our Hollywood movies is shaping...a form of mind control that was developed long ago, but perfected in the previous century by Sigmund Freud's nephew Edward Bernays. It is impossible to fundamentally grasp the social, political, economic and cultural developments of the past 100 years without some understanding of Bernays and his professional heirs in the public relations industry. PR is a 20th century phenomenon, and Bernays was widely eulogized as the "father of public relations" at the time of his death in 1995. The Father of Spin actually wrote the book on PR in 1928. It was called Propaganda. Escaping the Matrix gives real hope for finding practical ways for each of us to act by taking personal responsibility for changing the world through local action. But how do we awaken from this dream? How do we shake this shaping? 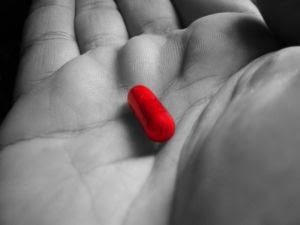 Where is our Red Pill?